Looking at the most recent polls, Hungary’s Prime Minister Viktor Orbán can be calm about the upcoming elections on the 8th of April. The only real question is whether his Fidesz party will win with a simple or a constitutional majority. But what is the secret of this football enthusiast? A seasoned politician with a background as a jurist, Orbán is an outstanding communicator, and comes across as a man who understands the average Hungarian citizen better than anyone. Mr. Orbán is no newcomer in Hungarian politics. Back in the days of the fall of the Soviet Union, he was the first politician to openly demand the Soviets to leave the country, and then went on to initiate a liberal democratic political system. Ironically, Orbán’s name used to be associated with liberation from the Soviet rule and the democratic transition of Hungary. He first served as prime minister from 1998 to 2002. Even though he narrowly lost the 2002 and 2006 elections, he was not inactive during his eight years serving the opposition. After winning a landslide victory in the 2010 elections, Viktor Orbán has made it. Hungary has never enjoyed this much international attention. Orbán likes to portray himself as the father of all Hungarians, the guardian who protects the citizens from any external threat. And figuring out just who the enemy is, is one of his master skills. Whether it’s the European Union, the refugees, the old philanthropist George Soros (who allegedly managed to convince refugees to invade Hungary), or the United Nations, Orbán is ready to fight. Blue billboards became Hungary’s version of Trump’s Twitter. He is not just an expert of how and when to create enemies, but also on how to profit from them, both politically and privately. But make no mistake, Hungary is not all that isolated. Mr. Orbán nurtures a great relationship with authoritarian rulers from former Soviet republics and the Middle East, and he cites Russia and Turkey as role models for the Hungarian version of “illiberal democracy”. Don’t rush to judge him just because he doesn’t want to welcome 1,300 refugees to Hungary. Until April 2017, he happily opened the doors for Chinese and Russians who were willing to pay 300,000 euros for residency bonds. Borders are also flexible when it comes to ethnic Hungarians living in neighboring countries. Their votes are precious. 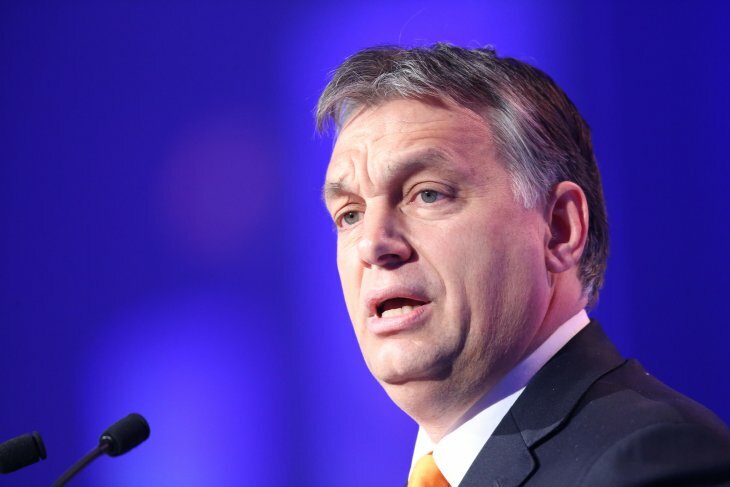 Why, despite all the international condemnation, do Hungarians still want Orbán? According to a recent voter preference poll, only a tiny percentage of the residents of Budapest want Fidesz to continue to govern the country. This is particularly clear among the highly educated voters. Those who are happy with the Fidesz rule are the pensioners, the countryside population, and the least educated. Orbán is very well aware of the Hungarian version of the Brexit sentiments. But in order to really understand Orbán’s success, do not focus on him, but on his competitors. International news rarely examines the Hungarian opposition, and this is not by accident. On one side of the spectrum, you will find the radical right-wing Jobbik party, which recently rebranded itself as a moderate party to attract more support. Jobbik is suffering from an identity crisis. Before the party attempted to revamp its image, its members were infamous for their extremist rhetoric, European Union flag burnings, and their anti-Roma and anti-Semitic rallies. In 2013 however, Jobbik leader Gábor Vona realized that the party had to move toward the center. This move was partly prompted by Fidesz’s successful capitalization of traditionally right-wing agendas and ideas, such as anti-immigration policies. Vona elected new, less radical vice presidents, and began a massive campaign to redesign the party, but many Hungarians doubt that the makeover is genuine. At the same time, Jobbik is criticized by its traditional radical voters, many of whom deeply oppose the party’s new softer direction. Jobbik is currently financed by Lajos Simicska, a well-known Hungarian oligarch, and former college roommate of Orbán. This man was until 2014 the closest ally and financial backbone of Fidesz, but after disagreements with Orban, he expressed his support for the Jobbik party instead. Even though Jobbik is the strongest amongst the opposition forces, its ideological transformation is looked upon with suspicion by many voters. On the other hand, the situation on the left is rather depressing. Just days before the elections, the liberal left-wing opposition failed to coordinate, sometimes even to agree on a meeting. Even though some hopes were raised with the February surprise victory of an independent candidate in a local election held in southern Hungary, the truth is that a unified liberal democratic choice is absent in the country. And it would be a mistake to (exclusively) blame Fidesz’s media machinery, its kleptocratic governing system, or the oligarchs who dominate Hungary’s contemporary business elite for the left-liberal incompetency. Liberal parties today are fractured, most of the time fighting over personal power. The oldest and largest party on the left is still the Hungarian Socialist Party (MSZP), and its splinter party the Democratic Coalition (DK). DK is led by Ferenc Gyurcsány, former prime minister of Hungary, who lost all his credibility in 2006 when he admitted to lying about the economic performance of the country to win election a couple of months earlier. Whether the Együtt (Together) and Párbeszéd (Dialogue) parties are fighting or cooperating varies from day to day, and this inconsistency alienates potential voters. The green opposition party, Politics Can Be Different (LMP), and the Momentum Movement emerged as alternatives to the old political left-wing elite. They are the most promising endeavors on the left, but unless they agree to form an alliance with the bigger and older parties, they are still too small to replace Orbán. All opposition parties are struggling to find a common cause to unite behind other than their mutual hatred of Orbán. This has led to such wild ideas as a tactical alliance between the left-wing and Jobbik. This is a dangerous path. It would legitimize far-right wing ideas, and left-wing candidates would appear as mere hypocritical power-hungry politicians. Voters would definitely have a hard time understanding what a pro-immigration policy agenda has to do with anti-Roma marches (even though Jobbik has now distanced itself from those events). No single party is strong enough to replace Fidesz alone. Cooperation is key, but whether the left-liberal opposition will be able to join forces behind a unity candidate on the level of individual electoral districts is yet to be seen. Due to the unfair electoral system created by Fidesz back in 2011, the only chance of the opposition is to choose a single candidate in every electoral district who will run against Fidesz candidates. But choosing one potential winner means that other party’s candidates will not be presented. This internal struggle over selecting the single strongest anti-Fidesz candidate to represent the opposition casts a shadow over the desire to challenge the rule of Fidesz. Until Hungary has one unified left-wing party to rally behind, far-right ideas will continue to dominate. The incompetence of the opposition enabled Orbán to win a landslide victory in 2010. It seems as though 8 years was not enough for the liberals to learn their lessons. Make no mistake, Hungary is not (yet) an autocracy. There is an opposition, and they openly criticize the government. In fact, they have their own billboards, but they lack one key ingredient that Fidesz possesses: Unity. I would wish the opposition luck, but politics depends on strategy and knowing the voters, not luck.